At our house, a large Birthday Bag for Jesus sits under the Christmas tree. This tradition started early in our marriage when we decided to throw a birthday party for Jesus. The first year, we invited a few family and friends and had the kids attending act out the manger scene. We had a birthday cake with candles and gave everyone a party favor that represented the true meaning of Christmas. They could sign the card or leave it anonymous and place it in the bag. On Christmas Eve, our family read the “gifts” and prayed that each gift giver would stay true to their intent. As the years went by, the party grew larger and larger. People heard about it and wanted to come and those who had attended before started expecting it each year. It also became an outreach as we invited neighbors and unchurched friends. One year, we had someone taking pictures of guests in front of the manger scene and then we gave them a printed picture. Our Birthday Party for Jesus became the highlight of many people’s Christmas season. We have since moved to a rural area, and while we don’t have the Birthday Party per se, we do have the Birthday Bag under the tree and guests to our home are invited to give Jesus their gifts. We also have a manger scene that our grandkids enjoy. 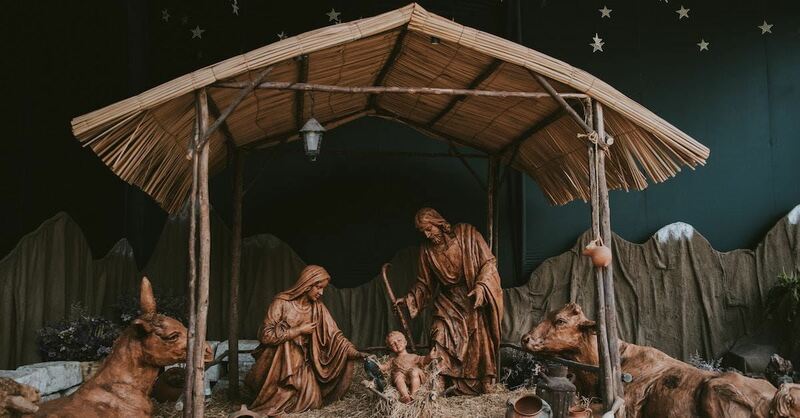 Below are some tips for throwing your own Birthday Party for Jesus and setting up a simple manger scene in your home. A Birthday Party for Jesus! Keep it simple so you don’t get overwhelmed and invite friends and family to help. Let the children act out the manger scene and Christmas story. Wise Men: Drape colorful pieces of material around their heads and adhere with cloth ties. Mary: Take an old sheet, cut a hole to go over her head, and cinch at waist with a tie. Drape another piece of sheet over her hair. Angel: Again a white sheet works great with gold ties. The point is to keep it simple and have enough towels, ties, and pieces of material for every child who wants to participate. Have someone read the story from Luke 1:26-38 and 2:1-20 as the children act it out. Sing several Christmas carols the children will know and Happy Birthday Jesus when you blow out the candles on the cupcakes. Serve finger foods so you don’t need silverware (use plastic if you do use it). If people want to bring something simply say “Sweet or sour finger food please.” That way you get a variety. Punch and hot cider, chocolate and coffee. Use Birthday invitations, make your own on Christmas stationary, or send out online. Be sure to give your kids a stack to give to their friends. I found Christian, inexpensive party favors at Oriental Trading Company or you can check at a party store or Christianbook.com. Be sure the favors relate to the theme of the party. One year we gave everyone a small battery operated “flame” with the theme of the light of the world being born on Christmas. For the Birthday Cards we designed them on the computer and then printed four to a page on cardstock. Or you could use Christmas stationary. The most important thing about the party is to remember the Guest of Honor. Have a joyous fun time doing everything to the glory of God. Be ready because your guests are going to want you to do this again next year too! Janet Thompson is an award-winning author and speaker. Please visit Janet on: Woman to Woman Mentoring, facebook, linkedin, pinterest, and twitter.